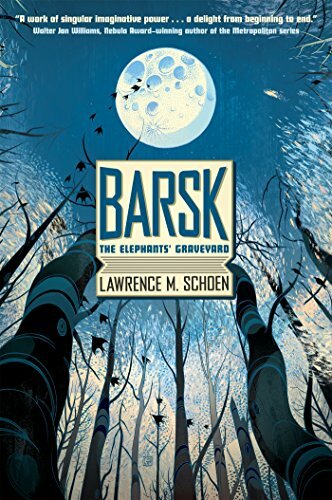 Set in the distant future, Barsk: The Elephants’ Graveyard has humans long extinct and anthropomorphic species dominating the galaxy—a species the humans helped to develop and create. Mostly known by Latin genus, the animals create a complex social structure and order on various planets and among themselves. There are Urs (bear), Brady (three-toed sloth), Cans (domestic dog), and more. Fants (shortened for elephants) are humanoid and prefer to keep to themselves. An Alliance holds the animals together based on economics and politics. Through the Alliance, the Fant maintain minimal contact with other creatures. The Fant are known for their pharmaceutical manufacturing, particularly of the drug called koph. Koph allows individuals called Speakers to summon and interact with the dead. There is a shadow faction in the Alliance intent on controlling koph, and they’ll do anything to learn the secrets of manufacture. The story begins with a Fant named Rüsul who dreams his death is near. He must find his way to a hidden island known only to the dying. According to legend, an old elephant knows when it’s about to die and will take itself away from the herd and direct his steps to an elephant graveyard where it will live out the remainder of its days, alone and far from their group. In Barsk this legend is imaginatively retold. In the process of Rüsul’s journey, he is kidnapped by a Cheetah and her followers, part of the shadow Alliance faction. They have been lying in wait for a dying Fant in order to learn how to manufacture the drug—any Fant will do until they get what they want. This is a unique and strange tale in its world setting and plot. The anthropomorphism is done well and animals are seamlessly given characteristics and language. The dialogue is clever and believable. Readers will feel as if they know each creature and that they are being “true” to their real life counterparts. Unfortunately, as seems to be the case with any book dealing with talking animals, each species has a stereotype. For instance, Cheetahs are dangerous and plotting while Brady (three-toed sloths) are slow and even-keeled. Schoen writes with skillful twists and turns. This compelling tale will leave readers awake until they finish the last page. Powerful themes are explored, such as racism and free will, as well as death. Teen readers and adults alike will enjoy this special novel. There is talk of a sequel.